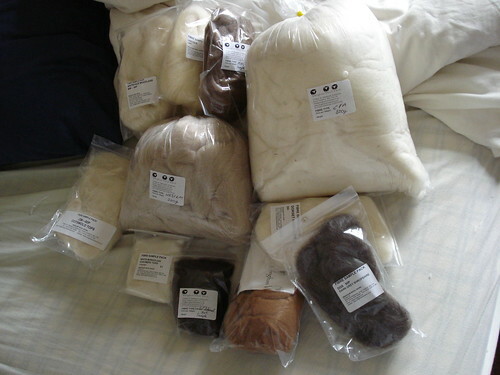 The main project I'm spinning for Tour de Fleece consists of fiber samples. I blogged about this briefly before, when I was just starting the project. The idea is this: To understand the differences between different varieties of fiber, particularly different breeds of sheep, I'm collecting small samples (50g or less) of a wide variety of fibers. Most of them are animal fibers (though I have tried spinning some cotton), and I'm limiting it to natural fibers only - so no acrylic, or nylon, or any of the multitude of flavors of rayon (bamboo, seacell, tencel, milk, corn, et cetera ad nauseum). Other than that, no fiber is too rare or too common - from the ubiquitous merino and BFL, to some tiny precious samples of cashmere and vicuna. Additionally, the fibers should be in their natural color - or not dyed into rainbow colors, at least. So in the end, I'll have several dozen mini-skeins of all different fibers, in whites, creams, browns, and grays. Going through these fibers I'm really starting to appreciate the wide variety of supposedly 'plain' natural colors. Even a white sheep may not be just white - it could be any range of sparkling snow white, to pale gray, to warm cream. I'm spinning each fiber on my tiny 6g drop spindle into 2-ply laceweight yarn - either spinning two plies separately, or for small amounts, one ply for an Andean bracelet, then winding into a double-stranded plying ball. If I encounter a fiber that I just can't spin on a suspended spindle, I'll spin it on my tahkli - but I've already spun cotton and camel down with my drop spindle, so I should be able to spin anything. As far as the nuts and bolts of the spinning go, I can't offer too much technical information - I'm just spinning each fiber 'as it wants to be spun', using my default style of spindle-spinning which is a sort of semi-woolen short draw. For plying, I tend toward the side of overplying rather than underplying. After each yarn is spun & plied, it will be wound into a skein then washed in warm water with Eucalan (unless it's not a hair fiber, like cotton or silk), and then snapped & whacked & allowed to air dry. Ultimately, I'd like to knit all these fiber samples into a simple shawl, inspired by Shetland hap shawls - something mostly plain, naturally colored, with a simple edging of feather & fan or similar. With upwards of 35 fibers, I should have plenty of yarn to knit the shawl, and I think the subtle stripes of different fibers will add visual (and tactile!) interest. It should be fascinating to have a "library" of different fibers to get to know them, what a great idea!